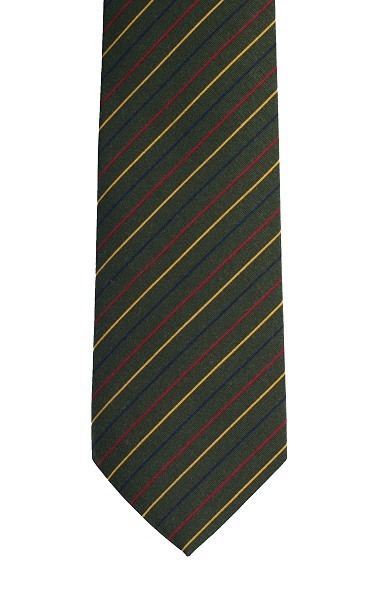 A classic olive green Royal Irish Poplin Tie made by Atkinsons, with fine yellow, red and navy blue diagonal stripes in a matt finish. This smart necktie adds a touch of class to any man's wardrobe. It is both milled and stitched in the UK and is both high quality and durable. Along with a design that will not go out of fashion any time soon this accessory should remain in use for years to come. A green Atkinsons Royal Irish Poplin Tie with a narrow single yellow and double navy blue diagonal stripe pattern in a matt finish.